I did a thing, you guys. I started a horror podcast and I am having so much fun talking about my number one hobby – the undead! Yes, I recognize that this is completely off-brand for me, but you have to hear me out. My Zombies Are Real Podcast brings me so much JOY. I’ve been toying with this concept for quite some time. In 2016, I got Zombies are Real on Facebook and I bought the URL (which has since expired). On Twitter and Instagram, I snagged Hug a Zombie because Zombies are Real was NOT available. For a few months, I ran the blog, but truth be told, I couldn’t keep up with written content. In long form, I just didn’t have the PASSION to dive deep into the horror world. As you know, I write SO MUCH for this site and as an online influencer. The last thing I could afford to do was dedicate more time on a new site. So, everything died down. I let it sort of fizzle out. But the dream remained. I always had this IDEA that I wanted to talk about horror movies, but I couldn’t manage to fit it into my schedule. Introducing the Zombies are Real podcast and the Zombies are Real YouTube channel. I found my way! I was having lunch with a few friends in NYC and we were talking about Permission to Hustle – the women’s entrepreneur podcast I do with my business partner. I was saying how easy it was to add that into my day to day life and how I always wanted to create a passion project – a horror podcast. Well, then why not do it? That was the question that was brought up during our meal. We spend so many hours working towards a hustle that, at times, eats us alive. My job requires a lot of my energy during the week and while I love what I do, this space doesn’t necessarily make sense when I write movie reviews about Split or Veronica or Gerald’s Game or It (2017). I mean – don’t get me wrong. It makes sense to ME, but to my reader???? I’m not so sure. A horror podcast will create a space for me to DUMP all my thoughts about the movies I watch on a regular basis without flooding my regular blog. It sounds perfect!! Why The Name Zombies Are Real? Are You Into Horror Podcasts? I have to be honest with you. I am SUPER NEW to the podcast world. I listened to a few today and I know that my podcast isn’t going to be ANYTHING like what I’ve come across so far. I’m not going to promote my creative writing or act as a means for me to read excerpts from horror books. I don’t plan on inserting creepy music for special effects. I am sure those horror podcasts have large audiences, but I don’t want to fit into that mold. My horror podcast is really going to be true reviews of movies and shows that I’m watching WITH scheduled guests to interview because it’s always fun to chat with friends. 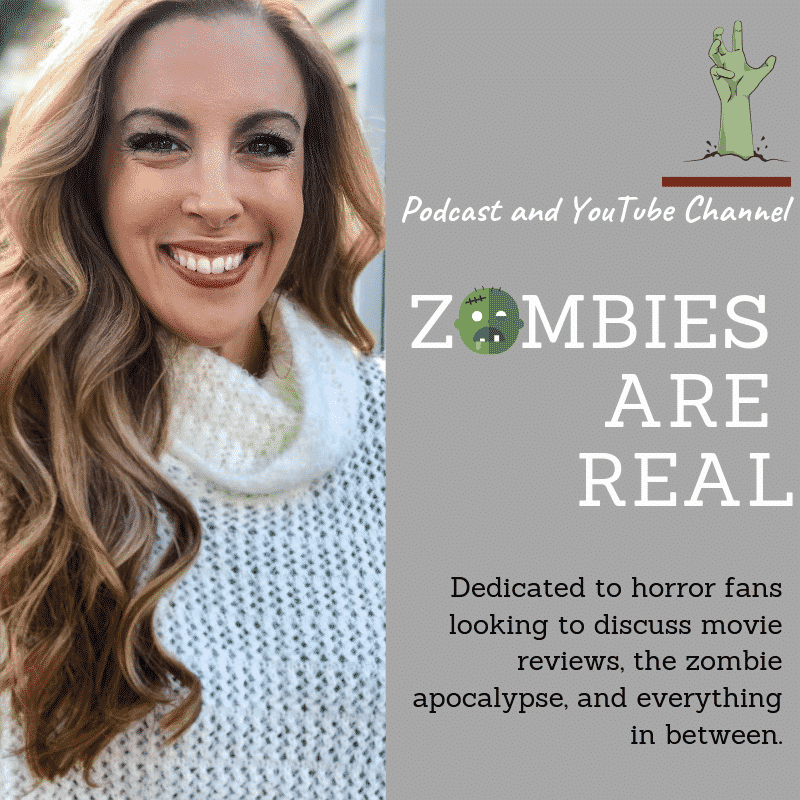 Where Can I Find The Zombies Are Real Podcast? Yes! I am actually trying to video all the chats and use the visual to create a film to put on YouTube. Sometimes, I just have audio and sometimes I have video. If you aren’t a podcast kind of person, you can listen to EVERYTHING on the YouTube channel and MORE. Click here to subscribe. I have to tell you – this horror podcast is an absolute passion project for me. I am not starting this with any intention of NUMBERS OR MONETIZATION. My number one hope is to find friends to chat with online about the shows and movies that I love. The people in my life do not like the same things that I do. My friends are into reality shows and RomComs and that is just not who I am as a person. So, I figured that I’d seek out online friends to chat with about my number one hobby. Hopefully, the Zombies are Real podcast will do just that! This is where I will upload a super witty outro referencing something to do with the undead. I haven’t thought of it yet. But it’s coming. But I think it’s fantastic that you’ve started a passion project that’s fun for you.